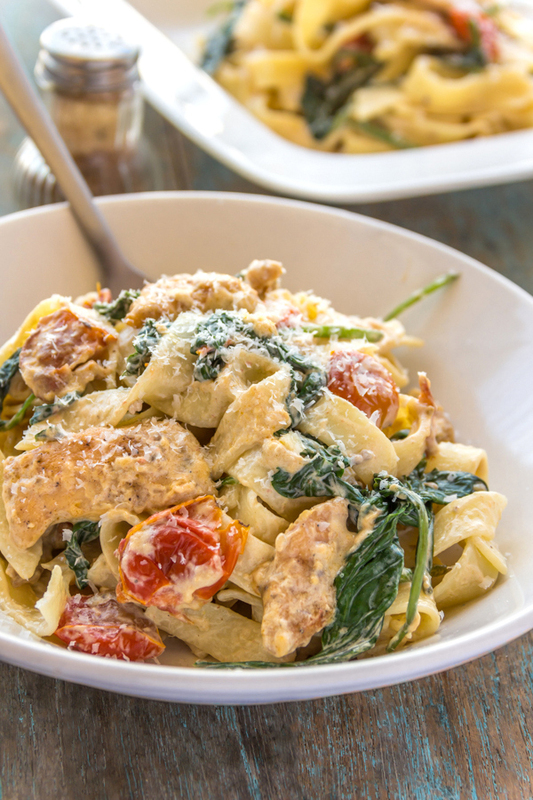 This creamy spinach and chicken pasta is an ultimate comfort food and even if you are not a pasta lover, you will still fall for it! It’s damn delicious! You must be thinking that here she comes again with another pasta recipe! But just hang on for a second before you judge me! Yes, I agree I’m quite a pasta lover (read ‘freak’), but pasta is such a wholesome meal which saves us working woman big time that I can hardly avoid it! It is less complicated and quick to pull off; so dinner is ready in less than 30 minutes; well most of the time if not always. 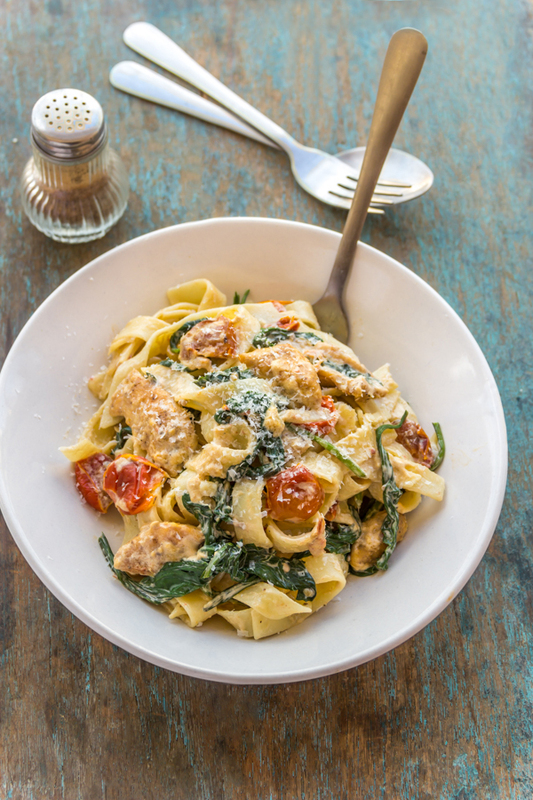 Today’s pasta is not only quick & simple, but also loaded with goodness from fresh spinach & roasted tomatoes and amazing flavors from the chicken & creamy sauce making it an all-rounder meal! 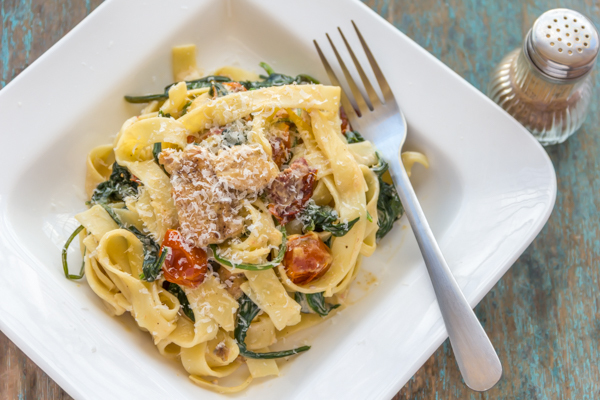 If you are being skeptical of spinach in a pasta, don’t be! Trust me; this gonna be a surprisingly mind-blowing dish which you will reach out for more than once. It is seriously addictive! I know I do pastas a lot; may be a bit more than any typical Indian household. But I can’t get over the unbelievable spread of pasta varieties and always become keen on trying a new one. And there are just too many ways of making pasta, which are fully customizable to your liking that you won’t ever get bored of it. You will always have something new to try out and that’s the most exciting part for me. My today’s recipe is adapted from the popular Irish chef Donal’s recipe. Yes, it’s Donal Skehan again and you know it’s gonna be a rocking dish! I used tagliatelle as Donal suggested as this rich creamy sauce compliments tagliatelle really well coating each noodles with incredible deliciousness! But don’t you worry if you don’t have tagliatelle handy; by all means use spaghetti or even any short pasta. 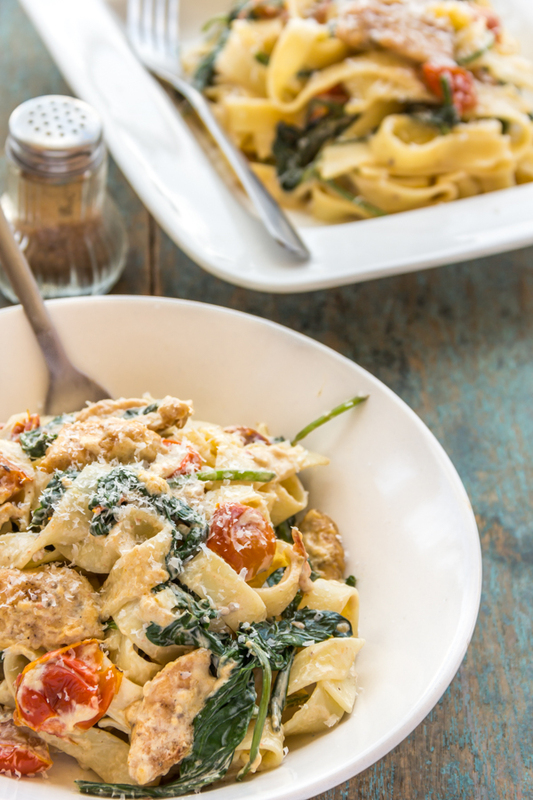 The chicken, spinach, sun-dried tomatoes with the creamy sauce are amazing enough to knock you off! I have already shared many chicken pasta recipes here in my blog. They all deserve equal appreciation, but I realized that my pasta making skill has matured with time and shows more signs of efficiency than before. I am more confident now to make my pasta perfectly al dente before combining it with the sauce and I can’t emphasize enough how important it is to get a hang of this al dente stuff! You will never want an over-cooked blob of soggy pasta which is nothing short of gross! Trust me, I have been there and I truly know how much it hurts! 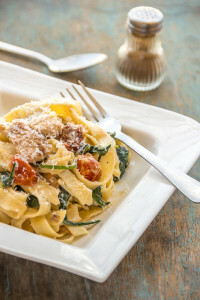 This simple yet flavorful creamy chicken pasta is a good option to start with pasta making in case you are looking for a beginner’s pasta recipe. You can hardly go wrong with this. Once done, no one will ever guess you made it for the very first time! First we will roast the cherry tomatoes. Preheat your oven to 180 C / 350 F. Cut each cherry tomato into half and place them on a roasting sheet keeping the cut side up. Drizzle the balsamic vinegar all over the tomatoes making sure each one gets their share, you may need to be a little generous. Sprinkle the sugar on top. Cook the pasta as per the packet instructions until they are al-dente. Drain and rinse in cold water. Keep it in a colander to let the water drip off. Heat half of the butter in a skillet or stock pot. Add the minced garlic and sauté it for few seconds until fragrant. Next goes the chicken strips, season with salt and pepper and sauté them until golden brown and cooked through. This would take about 6 to 8 minutes on medium-low flame. Then add the remaining butter and once it melts, pour in the cream. Let the cream come to a simmer and thickens little bit. Then add the spinach leaves and let them wilt. Spinach cooks down way too much, so don’t be afraid to add as much spinach as you want. Once the spinach leaves have wilted down, add the roasted tomatoes (or the sundried tomatoes) and give a good mix. The sauce is ready. Check and adjust the seasoning if needed. Now it’s time to combine the pasta with the awesome sauce. Pour the sauce into the pasta pot and give a good mix using a tong. Serve hot with a good sprinkling of Parmesan cheese!